Melt the fat in a skillet and add flour let simmer until golden brown then add the milk bring to a boil, turn off heat, add cheese and stir until thick and creamy and all the cheese is melted. Put into the oven for roughly 10 minutes at 400* or until cheese is melted. Take out, let cool, and serve. For this experiment I changed the fats in my roux to see which had the best flavor and the creamiest consistency of the sauce. Sauce A is made with margarine, sauce B is made with lard, and sauce C is made from butter. My hypothesis was that the best tasting and creamiest mac and cheese would be the one made with butter. The results showed that margarine was the creamiest sauce, with butter a close second, the least creamy was lard. The most flavorful however, was sauce b the lard. The second was sauce a with the margarine and no votes went to butter. In conclusion the creamiest mac and cheese has margarine in the roux and the most flavorful has lard. Margarine is hydrogenated vegetable oil, Butter is made of milk fat and lard is pure meat fat. The survey I created showed that people preferred the margarine over either lard or butter in terms of creaminess. Margarine is made up of super processed oils but is still significantly healthier than butter as butter is full of saturated fat. Lard is the least healthy because 40% of the fat in lard is saturated fat making it terrible for your heart. So not only is margarine the creamiest and second most flavorful, but it is also the most healthy. a. How can food’s energy content, nutrition, texture, taste etc. be explained in terms of the atomic, molecular and macromolecular structure of the food? Foods energy content, nutrition, texture, and taste are all chemically different. Food’s energy content relies on calories which are a way of measuring energy, or how much heat is given off when burned. Nutrition is given with carbohydrates, proteins, and fats. These are utilized by breaking down the molecular structure, the body absorbs the new cells and utilizes them for energy. Texture depends on how the food is cooked and therefore the molecular structure which changes with heat. b. How does cooking transform food and how can these transformations be understood as chemical processes? Heat has the ability to expand the molecules and sometimes a chemical reaction occurs, changing the food. c. How can we design an experiment and measure the qualities and desirability of a finished recipe both quantitatively and qualitatively in order to determine the success of our recipe experimentation? To design an experiment that represents and measures the qualitative and quantitative success of a recipe you simply conduct a taste test, it measures flavor, texture, density, and overall success of a recipe. d. In what way(s) are cooking and doing science similar and in what way(s) are they different? How are a cook and a food scientist similar or different? Cooking and food science are similar because they both involve the changes that occur to food when cooked. The reactions effect both a food scientist and a cook. They are different because cooking is more of an art and food science is a science. This textured painting of the Animas River and surrounding areas represents the various pollution sites that might impact the water quality of the Animas. These include water runoff from communities, which includes oil, fertilizer, human waste and mineral runoff from the surrounding mountains. The viewer will be able to listen to different summaries corresponding to numbers on the mountains, river, and surrounding community. These sound bytes will add an audio aspect to our exhibit to accompany the visual aspect, which will act to further engage our audience. The main issues that we are addressing with our painting are non-point pollution sources, as these can become extremely problematic if left uncontrolled. While the problems are being stated, we will go into detail about exactly how these pollution sources negatively affect the river, whether it be through simple toxicity or the process of an algae bloom. We hope that the audience will consider this exhibit to be important for many reasons. Locals will feel compelled to learn due to the fact that the Animas River is a key part of our city, and they will likely want to take care of it for themselves as well as the greater Durango community. Visitors to our city will likely want to learn because they frequently interact with this water this may be where their water comes from, or if they do not interest with the Animas/San Juan River, they should like to know that the issues that we list apply to almost all bodies of water. We created our exhibit because it would be educational to all audiences who want to learn about these issues, while also focusing on the skills that we both excel in (painting, detail, research, writing). Our work is part of a collective class effort to create many prototypes for this exhibit in order to find out what might work best for this educational facility, while also attempting to educate ourselves and others in order to create an overall better understanding of water quality and pollution. The audience with whom we wish to communicate this information is of all ages. In creating our exhibit, we have done our best to convey the information in a manner that is both understandable for youth and digestible for adults. Additionally, the information is easy enough for beginners to the subject to understand while also being at a level that is comprehensive for those who have a greater understanding of water quality. We also hope to appeal to those who learn visually as well as through audio, as this exhibit will have pleasing visuals as well as clear audio recordings, both of which will correspond to the same information, ensuring that everyone can learn through our exhibit. We believe that our exhibit should be a part of the SRWRF for multiple reasons. For example, it is highly informative and appeals to a wide range of audiences due to the ease of understanding that it provides for all ages. With this, our painting as a mural would contain information that is relevant to every visitor who examines it, resulting in possible improvements to national water quality; a farmer may try to reduce their agricultural nitrate output; an apartment dweller may learn about their water use and how pharmaceuticals from their drain may enter a reservoir; a miner may learn about acid mine drainage. Additionally, it will result in an increase of the decorative allure of the entire room, which would effectively draw people to it as a result of the optical pleasure that it may bring to visitors to the SRWRF. In this project I learned how to take various water measurements from turbidity to ph. You can measure turbidity with a propeller on a rod connected to a electronic device that measures it. When measuring ph though you can use various color indicator solutions that change color according to the ph of the given substance. I learned how to safely use indicator solutions with gloves and goggles. My favorite lab of the unit was the ph testing portion when we found the ph of 3 different waters with indicator solutions. Another lab that I learned a lot from was the water purifying lab in which we used charcoal, sand, and gravel to purify putrid water with garlic coffee grounds and other toxins. The end result was drinkable water. My team also used a handmade distiller that evaporated all of the pollutants out of the water. The biggest new skill I learned was how to be conscious of the water around me. I now know how precious and delicate water is. The ways which you can test water are very versatile from ph to pollution it all affects the quality. 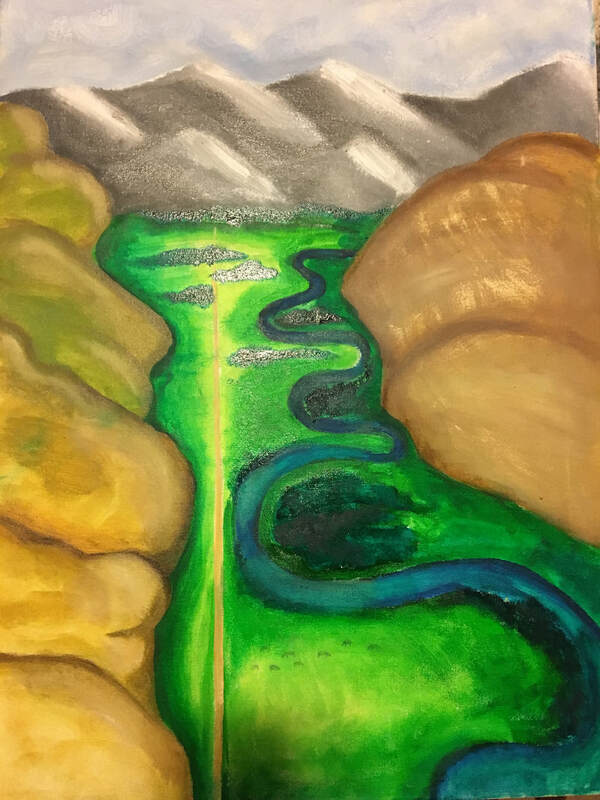 Another skill i learned strangely enough is oil painting, for my final product I made a painting showing point and nonpoint pollutant sources for the animas river. I think that our class in particular now has a greater appreciation for the work that goes into the water we drink, and use. As a citizen I will now advocate for water protection like our new treatment plant and the excessive amount of testing after the gold king mine spill.